When Sam and I visited Argentina a couple of summers ago we made a few contacts, one of whom was through a friend of Sam’s living in Argentina and working in the business down there in the Famatina Valley. We tasted through quite a few of the wines he made for himself and other clients, but the one that really stood out was his Torrontes – beautifully aromatic with crisp minerality. We never quite got around to purchasing the wine, having committed to quite a bit of Malbec at the time, but in the fall of 2010 I remembered the wine and inquired about potential availability. Our contact told us he would have availability come the 2011 harvest and we could taste the wine shortly thereafter to reserve an allotment. Reserve we did, buying up the entire parcel of this beautiful wine. The known history of the Torrontes grape can be found here and it’s worth a read if you are interested in learning more about the grape. My own take is that the grape has the acid structure of Sauvignon Blanc and the aromatic profile of a Muscat or Moscato grape. Lot 305 Famatina Valley Torrontes certainly has those qualities with beautiful floral and fruit aromatics. Jasmine flowers, lemon peel and nectarine fruit are abundant on the nose. Lot 305 was fermented and aged purely in stainless steel, bringing a brilliant acidity to the midpalate, but also succulent texture added by some skin contact. This is an exquisite wine. We only have about 500 cases and I know it will go fast. 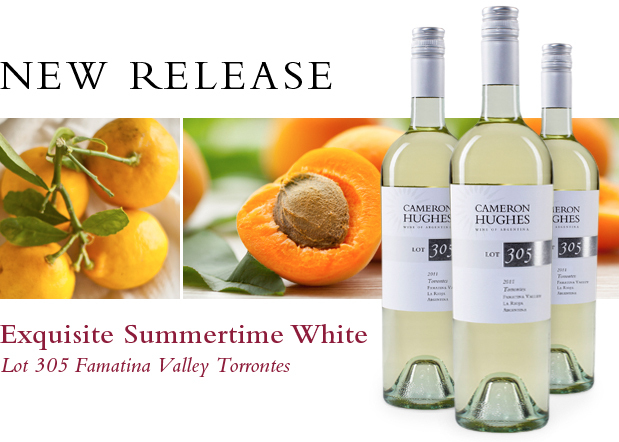 Try this wine - it is special and one that I plan on having all summer long with my friends and family. Copyright © 2012 Cameron Hughes Wine All rights reserved.